Nothing perks you up in the morning like a strong dose of caffeine ... and the sight of two large pythons duking it out just beyond your window. Keith Williams, a local politician and New South Wales resident, was making his morning coffee when he noticed this reptilian commotion going on right outside. He quickly recognised the animals as carpet pythons, as he's long shared his yard with this species. And his yard is not all he's been sharing: a couple of these snakes also took up residence in his roof years ago. This recent sighting, however, was a lot different to what Williams is used to seeing: a writhing and wrestling battle that lasted for an impressive 45 minutes. Williams believes the snakes that live in his roof are a male and a female, and that the fight was between the resident male and an intruder hoping to gain mating rights with the resident female. Australia is known for its diverse and dangerous suite of serpents, but carpet pythons (Morelia spilota) are not among the yard snakes that bother Williams. "Around here, I really only worry about the eastern brown snakes," he told me. "We had two move into a garden about five metres from the house last year. Our local snake catcher helped re-locate them away from the house." His resident carpet pythons may well have benefited from this intervention, as brown snakes sometimes eat them. Interestingly, Williams was in a good spot to catch a carpet-python fight because the mating tactics of this species vary across their range. The snakes can be found in coastal areas around much of Australia, as well as through nearby island nations to the northeast, including New Guinea and the Solomon Islands. In some areas, males are relatively small and travel vast distances searching for sexually mature females. Once they find a potential mate, they'll spend a long time hanging around her. In other regions, including Ballina Shire where Williams lives, suitors fight each other to establish dominance and gain the opportunity to mate; in these areas, males tend to be larger than females because their size offers them an advantage in their battles. At up to a few metres in length, carpet pythons can get quite large, but they're not considered a threat to people; instead, they prey largely on birds and small mammals, including some non-native animals that have invaded Australia, like rabbits. Their adaptable eating habits might help explain why some individuals don't mind setting up home in relatively urban landscapes. Fortunately, conflicts with people are minimal, and many residents appreciate having these large reptiles around (although at least one case has been reported of a carpet python eating a pet dog). The snakes can appear different throughout their range, and their beautiful patterns and variability (along with their calm temperament) make them popular pets. That global popularity is why they're sometimes found slithering well outside of their native range. A handful have shown up in Florida in the United States, but they're not considered established there like their more famous cousin, the Burmese python. 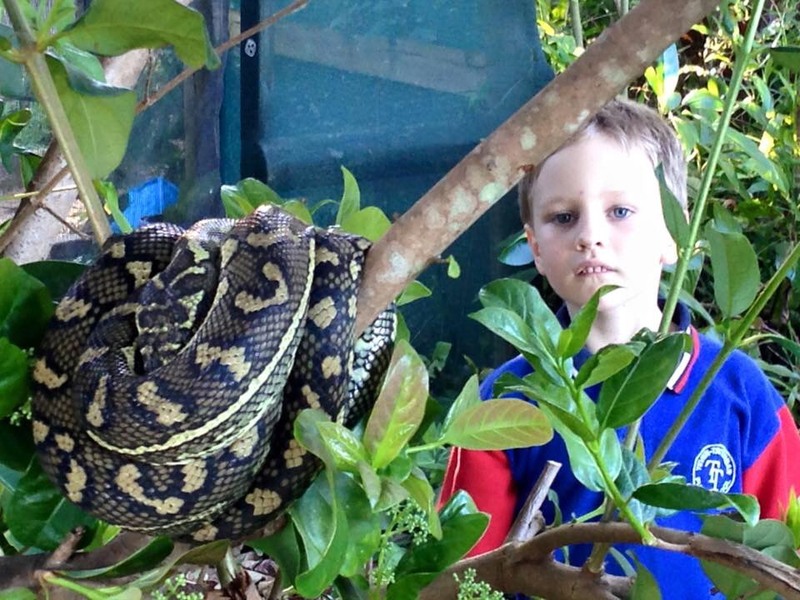 Keith Williams's son, Finn, poses with one of the resident pythons in the garden. Overall, the species is not considered threatened, although subspecies in certain areas are vulnerable to population declines due to changes in their habitat and other threats. As for Williams's reptilian lodgers, if all goes well, the household could have a lot more company in just a few months. Reptiles generally don't have a reputation for being attentive parents, but female pythons (including carpet pythons) tend to stay with their eggs after they're laid. The mothers will coil around their clutch (which could be dozens of eggs) to help control the humidity and temperature of their developing progeny. A couple dozen python babies might be a scary prospect for many people, but don't count this household among them. "I do what I can to help the wildlife that lives around me," says Williams. "I've put up nest boxes, replanted native rainforest and volunteer with a wildlife rescue." And even large pythons are welcome in this neighbourhood. "Snakes are part of a balanced ecosystem where I live," he adds. "I reckon these particular snakes have lived in the roof longer than I've lived in the house." This corner of the swamp isn't big enough for two.